For a few years now, Kiev has been the city on the lips of everyone in the fashion world. During the late 2000s a handful of designers decided to kick back against local consumers’ obsession with luxury and create a more contemporary and sleek vision of womenswear. They entered a tricky terrain by buildings their brands with a total lack of infrastructure and institutional support, but the truly big shake-up came later, after the revolution of 2014. The industry was hit hard by the economic crisis. For designers, it soon became apparent that it wasn't just about making fashion anymore — it was about creating a new identity for an emerging generation. Kiev today is changing rapidly to welcome increasing numbers of visitors and gravitating more towards Europe and the West. At the same time, the search for Ukrainian identity is becoming ever more crucial among its creatives. Ukraine’s new cultural scene is still in the process of being created, and fashion designers, photographers and artists are in it together. Today Ukrainian designers are starting to receive more international recognition from buyers, stockists and press. Paskal now have over 50 stockists worldwide including Paris’s Colette, London’s Selfridges and Tokyo’s Dover Street Market. Ksenia Schneider, Bevza and Litkovskaya have caught the attention of the international press. But in times when the fashion world is driven by image like never before, it’s also about having a shared vision. 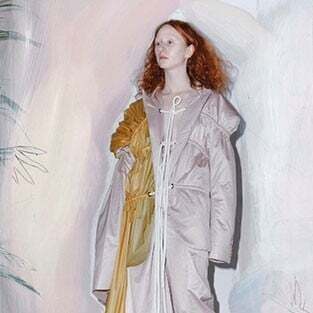 With the rise of youth culture and the enviable independent rave scene in Kiev, designers like Anton Belinskiy, Yulia Yefimtchuk and Sasha Kanevski are trying to channel this energy into their collections. The movement also spans beyond fashion: their frequent collaborators include photographers like Join the Cool collective (Kristina Podobed, Mishka Bochkarev and Genia Volkov) and Armen Parsadanov, video makers Yarema&Himey, independent modeling agency Cat-b and even pop star in the making Luna. It’s about the scene rather than individuals, and it could be the key to a long-awaited international breakthrough. With the announcement that Anton Belinskiy is going to participate in the Ukrainian pavilion at this year’s Venice Biennale, and OneDayProject’s showroom coming to Paris on the 1st of March, this year might be a big one for Ukrainian fashion. With the design scene on full throttle, Kiev also has a range of stores where you can shop for its latest offerings. The minimal space of Corner Concept Store in the middle of the newly built pastel-coloured neighbourhood of Vozdvizhenka is one of the best locations to check out and buy collections by Bevza, Lake, Yulia Yefimtchuk and other prolific talents. Hello Glasses next door is a great spot to shop for sunglasses or frames. The discrete white-brick basement of Atelier1 is one of the best-kept secrets of Kiev’s fashion crowd thanks to its impressive range of Comme des Garçons, Junya Watanabe and Issey Miyake pieces. Sanahunt and newly opened TsUM are two rival luxury department stores in the west. High-end design however is not the only thing Kiev has to offer: its also one of the best places in the world to shop for vintage and second-hand clothes. The prices are absurdly low and the stock limitless and constantly renewed. The most famous spot is Lesnoy market on the outskirts of the city with its endless stalls and piles of clothes and shoes, but the whole city is full of small second-hand stores potentially full of good finds. Kiev street style, influenced by the diversity of the design scene and its emerging youth culture, is always vibrant. Vintage leather pieces and shoes are often mixed with colourful Nineties sportswear and garments produced by local designers. Despite the fact that most designers produce womenswear, brands like Subrosa and Sasha Kanevski promote unisex and complete freedom in what to wear and how to style it, both for men and women. The DIY spirit here is always on the rise: they make it up as they go along, and that’s exactly how they’re used to doing it, both in fashion and in life.